They look nicer than I expected... looks like a swivel based kind of like an Arlo. Also, if you go to the app and view a live feed of your cameras, it has a slider for audio. Nothing playing out of mine but I wonder if there's any hope for an existing camera firmware update. After reading through the description and specifications I think I will stick with my more reliable PoE IP based cameras that are recording 24/7. I wish they would enable support for the Wyze cameras. I picked up a pair of those off Amazon and they are nice for indoor use. The app is great. Cameras can be set to listen for a smoke or CO alarm and send you an alert if heard. They have motion and sound detection (with push or email notification) and two-way audio. On board recording to a microSD card (not included), free 14 day cloud storage of alert clips. For $25 they are tough to beat. Super easy to setup. Plug it in, push the button on the camera, and it tells you what to do next which is use the Wyze camera to scan a QR code on your phones Wyze app. I had the two cameras setup, connected to my LAN, and running in less than five minutes. So easy I bet a 5 year old could do it. The Wyze cameras work with Alexa, so you can use your Echo Spot or Show to view any camera with a verbal command. They also support IFTT so you can come up with all sorts of uses. "Alexa, view garage camera" is all you need to say. You can set do not disturb times and also do full screen or partial screen motion detection with the ability to adjust the detection levels for motion and sound independently. I will never buy another overpriced, featureless Iris camera. For the $300 I spend on two Iris cameras I could buy 12 Wyze cameras. I can't wait to hear how they work. This is something I could really use in a couple of places. Just got off the phone with Iris support to ask them about removing an extra place that won't delete and we spun the conversation off on the new camera. Camera things: There will be four levels of sensitivity on the camera that you can adjust it for short or long range motion and the base is magnetic so the camera is easy to snap off for recharging and put back up. Also they are also running a promotion on the camera starting on the 14th, so I guess that would be a good time to look at them if you are considering one. Sounds pretty interesting, I might get one just to poke around with for places that don't have power easily accessible. New camera is missing record on all rules and camera page. Lol. Hopefully it’s an update coming soon, what good is a camera that doesn’t record. They are on sale so I got one to try out. I called support and asked about them too, I asked how the rules worked and if you could set it to record based on "away" or alarm on. They told me the same thing that the camera has user adjustable sensitivity but said regarding the rules that it auto records ... automatically. Can you confirm on your clips page if it indeed is auto recording based on motion? Yeah it is auto recording for sure but I would think they would let you manually record or at least give you an option to schedule recording like the other ones do. You can turn sensitivity to off and that will stop recording but that’s a manual process. Hopefully they will come out with some app tweaks soon. I agree it's strange you can't manually record, and to my point it's strange that if it's going to always record, that you can't set it to NOT record while you're home. Saw this today on swann’s site. This might really come in handy!!! I just ordered one and used a $20 off $100 coupon, making the camera $99 before tax. Sounds like the app isn't perfect yet, but for $100 I think it's worth a try. That’s exactly what I did. I installed mine on the front porch today so time will tell on how good it does. So far so good. Didn’t want to screw in the siding so the flashing on the door worked. Is there an option to embed a timestamp in the video? I wish there was! That would be a great feature. It shows on the thumbnail clips but not on the video itself. That looks exactly like my idea... did you screw it into the moulding? And is that the magnetic base or did you get the screw on one? The magnetic one seems like it could have a theft issue, but then again if someone wanted it and it was on a screw one I don't think that would stop anyone. Yeah I put the two screws in the molding above the screen door frame. This is the magnetic base and I thought of the same thing but if someone wants to steal something, they are going to do it if it is screwed on or not. My wife said the same thing and I told her that they would be on the camera before they could reach it. Since I am trying out the battery option here (plug right below it) I wanted to go the easier route of charging it. My wife said the same thing and I told her that they would be on the camera before they could reach it﻿. Not to be negative, but if they wear a ski mask you probably won't be able to identify them. Very true, our neighborhood is well lit and lots of people coming and going so hopefully that helps. No one has messed with the other ones I have on the front garage so “fingers crossed”. I could always put it higher up if need be. If you mount it too high you'll just capture the tops of their heads. Night vision isn’t too bad either. These are screenshots from my phone by the way. 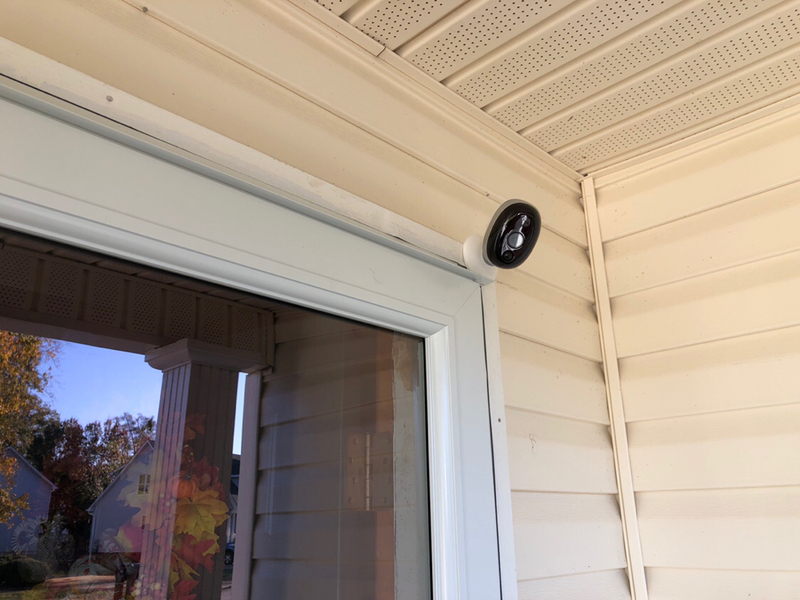 Will the camera record in color at night if you turn your porch light on? Not bad, but I'll stick with my Dahua cameras.